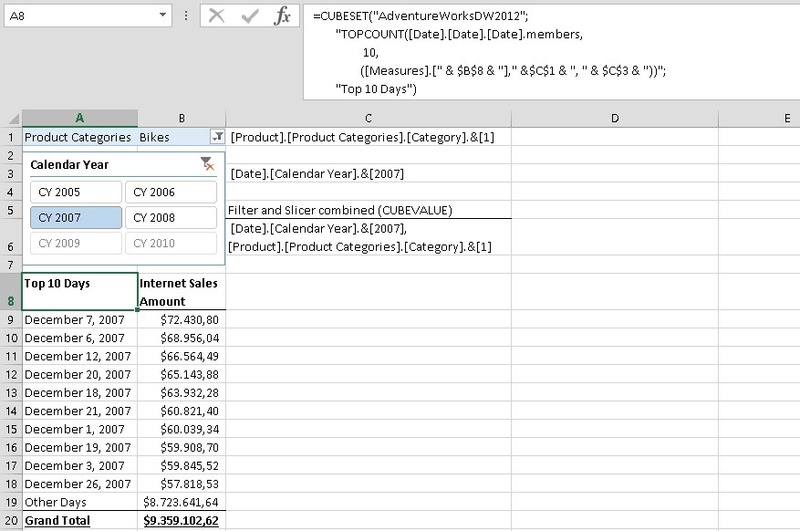 This entry was posted in Analysis Services, Excel, MDX, Multidimensional, PowerPivot, Tabular and tagged cube-functions, filters, slicers, topcount, TOPN by Gerhard Brueckl. Bookmark the permalink. Great article, thank you. Could you additionally explain the network architecture of such solution? Excel generates DAX, SSAS executes it, but does the direct access to the SSAS required and ? Is there the way to get the DAX request as a http/wcf/odata request on the custom middle layer service, then send it to the SSAS and when get results as recordset return them as ODATA back to excel ? 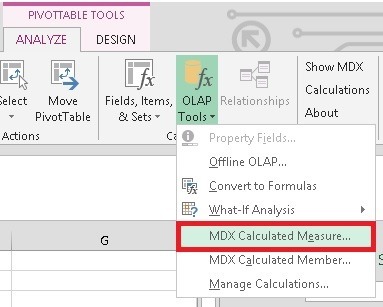 so Excel executes MDX if you use Pivot Tables or Cube-Value functions and DAX if you run Power View reports. In both cases, in order to see live data, you need a access to the SSAS server. All this does not involve any http/wcf/odata or whatsoever but just XMLA (http://en.wikipedia.org/wiki/XML_for_Analysis) where the MDX/DAX is wrapped into as an -command. I don’t actually understand why you want a mid-layer and return the data as OData? could you elaborate a bit on your scenario? Hi Gherard. As I’m thinking about the middle layer architecture could be useful for distributed geographically and administratively organisations that have common intranet but do not have VPN. Such middle layer could isolate SQL Server (as it is usually installed with SSAS on the same machine). Also such middle layer could quickly inspect and audit requests. 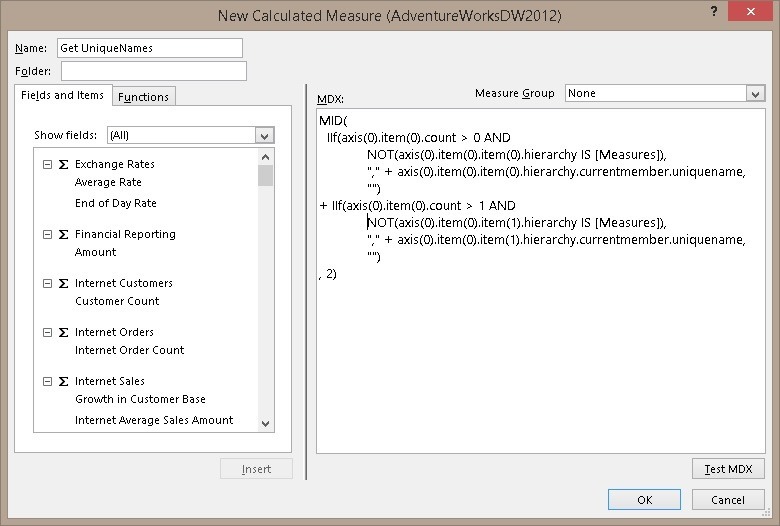 But I can’t imagine how Excel could execute MDX/DAX if data is remote… What SSAS is doing then? Thank you for the link to SSAS access via http. If such server could be installed outside the SSAS machine – it is a solution. P.S. But the question what is the role of SSAS server if Excel executes (means parse MDX/DAX and translates them to data read operations) left unclear for me. Its a simple client-server architecture, similar to executing a SQL query from a client (e.g. using Management Studio) on a remote SQL Server. SSMS does not execute query… It sends it to the server as plain text, server really do all work. Let say that was a terminology problem, what is important that excel sends the MDX/DAX as plain text command to the SSAS and SSAS return recordset and the http proxy can be used for that. Hi Gherard. is there a way to handle this (top 10) with EWA in excel service? what exactly do you mean by EWA?